People on the Galata Bridge over Istanbul’s Golden Horn. 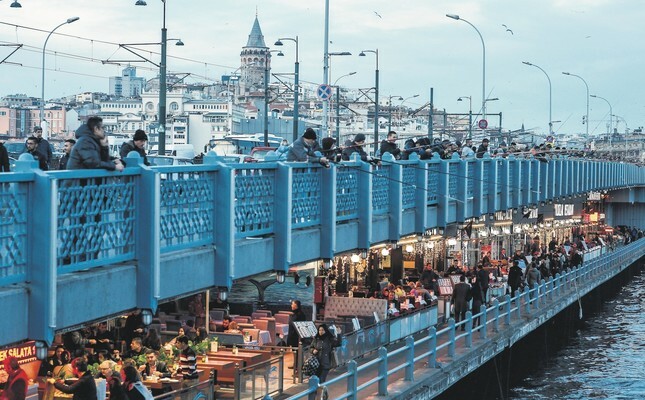 The city is the most crowded place in Turkey and has a population of over 14 million people. Figures compiled by state-run Anadolu Agency (AA) shows that the country's population grew to 82.8 million in 2017, more than 3 million higher than in the numbers announced in December 2016. Along with the population increase, marriage and divorce rates also rose in Turkey. The population growth might be good news for the government that has been striving to address an aging population problem. Projections made earlier by the Turkish Statistical Institute (TurkStat) show that the elderly population will increase to 10.2 percent by 2023 and is expected to rise even further in the following decade. Experts link these projections to a decline in fertility and the availability of new treatments that increase longevity. The rise in population apparently demonstrates a new trend as the 2016 population was only about 1 million higher than in 2015. A set of incentives by the government for larger families and the famous advice of President Recep Tayyip Erdoğan to newlyweds to have at least three children might have played a role in the growth. In a bid to have more women in the workforce and to help women pursuing careers to start families, the government announced monthly daycare support for mothers with children between the ages of 2 and 5. The government already pays benefits to parents per child with plans to gradually boost the amount and offer more cash to families with more children. Statistics show there were 1.3 million newborns in 2017, and 447,342 people lost their lives in the same year. Another figure published by AA yesterday shows more than 603,000 people married in 2017 and more than 136,000 divorced. Compared to figures released by TurkStat last year, the marriage rate is much higher when compared to the 594,493 in 2016, but divorces also showed a slight increase in 2017, compared to the 126,164 in 2016. Experts attribute the divorce rates to a lack of marriage counseling. The Family and Social Policies Ministry offers marriage counseling services to prevent divorces. If a divorce proceeds anyway, the ministry also offers counseling services for the children of divorced couples. Domestic violence, a common occurrence in the country, often leads to divorce. Turkey has stepped up police protection and increased shelters for women to fight the disturbing, rising trend of spousal violence. In 2016, the country introduced new smart IDs to replace the outdated, bulky cards, and AA figures show the number of people who received the new credit-card-size IDs totals 15.7 million. The new biometric cards contain chips to prevent forgery and falsification. Unlike the old IDs, they also contain data, such as holder's finger and palm prints. In the same report, the agency also published compiled statistics regarding street and neighborhood names. "New" was the most common name for neighborhoods last year, followed by "Republic." Most streets were named after Atatürk, the founder of the Republic of Turkey. Other common street names were "İnönü," after Turkey's second president İsmet İnönü, and "Fatih," the nickname of Ottoman Sultan Mehmet II known for his conquest of Istanbul.